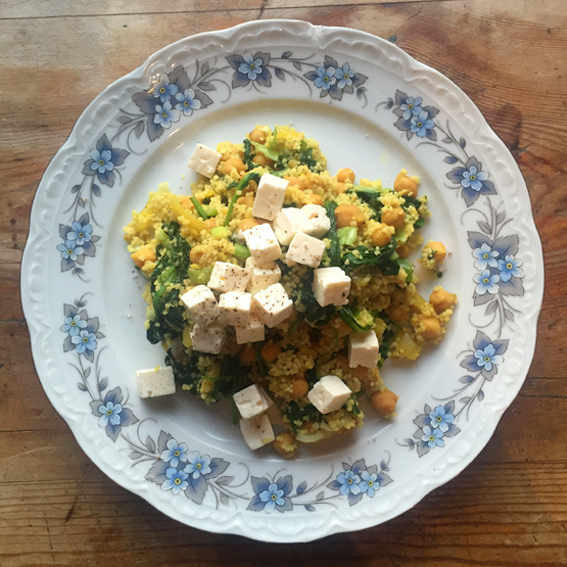 Look, I know I just did a couscous recipe but like I said in my previous post, I’m poor and a bit fat so give me an effing break… Also, I appear to only have a giant bag of couscous in my cupboard so should probably try and make some sort of dent in it. Anyway, if I find myself becoming too bored of couscous I can always try and feed some to my new housemate, a small disgusting mouse I’ve decided to call Vince. He moved in last week while Max the dog was on holiday, not cool. So not only do I have my poverty and fatness to contend with but now I have to try and evict Vince if I’m ever to coax my terrified boyfriend out of the bedroom. 1. Pop your couscous in a big bowl and cover with the stock. Give it a brief stir with a fork, cover with cling film and put to one side. 2. Spray a pan with oil and add the onion, garlic and the chilli on a medium heat. Add water as and when you need to, to prevent the vegetables from burning and allowing them to steam. 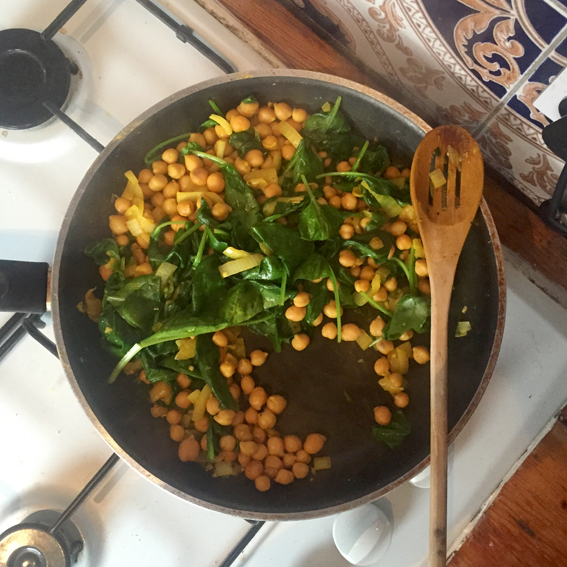 Add the drained chickpeas, the turmeric and cook for a couple of minutes. Season with salt and pepper. 3. Start adding the spinach a handful at a time, allow it to wilt before adding another handful. (Keep adding a couple of tbs of water to the mix as you go, again to prevent burning and to help the spinach steam). 4. Once you’ve wilted all the spinach, season with salt and pepper and put to one side to cool slightly. 5. Remove the cling film and start raking the couscous with a fork to make it nice and loose. 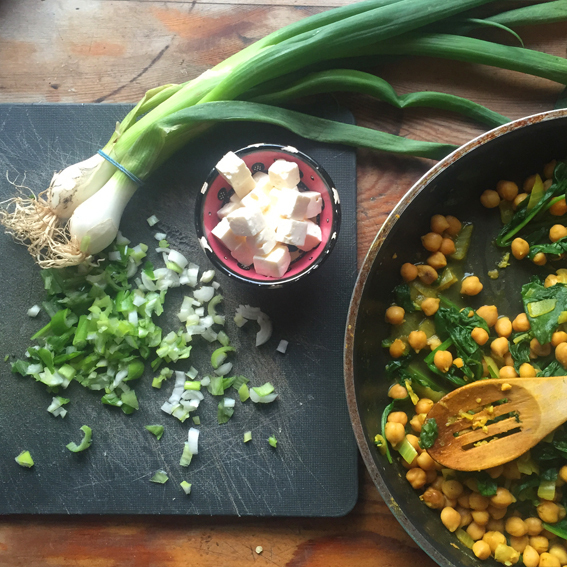 Add your warm chickpea mixture to the couscous and give it a good stir. 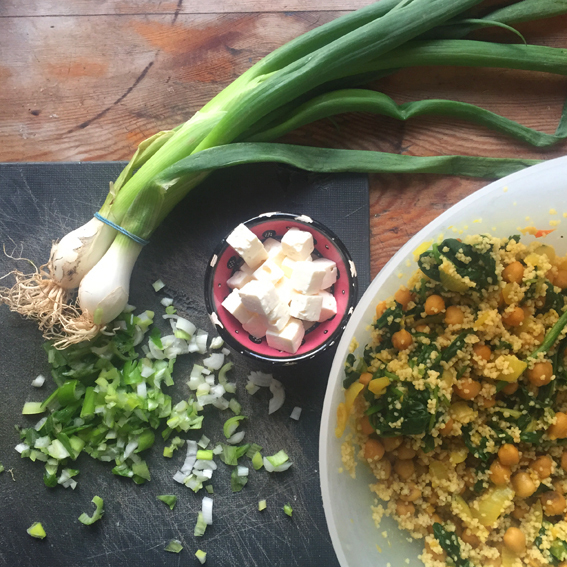 Finely chop the spring onions and incorporate them into the couscous. 6. Finally, top with feta cheese and serve. Good! Things to do with Causcaus, having bought some on ‘special offer’ about a year ago it’s good to have a few ideas on what to do with it…other than bait for mice!